Han J, et al. Effect of Perioperative Gabapentin on Postoperative Pain Resolution and Opioid Cessation in a Mixed Surgical Cohort: A Randomized Clinical Trial. 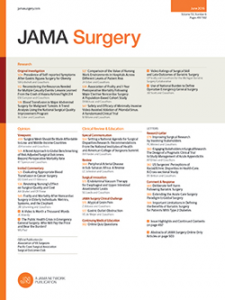 JAMA Surg Apr 2018 ;153(4):303-311. What is the clinical question being addressed? Was the assignment of patients to treatment randomized? Were all patients who entered the trial properly accounted for and attributed at its conclusions? Were patients, their clinicians and study personnel “blind” to treatment? Were the groups similar at the start of the trial? Aside from the experimental intervention, were the groups treated equally? How large and precise was the treatment effect? Can the results be applied to my patient care? Were all clinically important outcomes considered? Are the likely treatment benefits worth the potential harm and costs? State the conclusion. Have the authors addressed the question posed? Does the evidence support the conclusion?